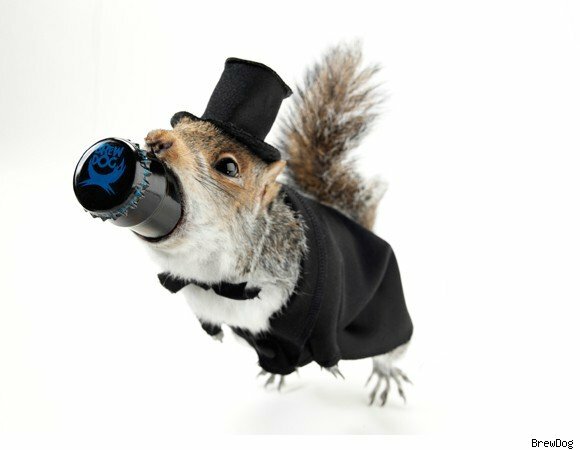 Not content with attaining the "strongest beer in the world" title with it's Sink the Bismarck, the guys at BrewDog have taken things a step further with a new brew that comes in at a whopping 55 percent ABV and carries a princely $765 price tag: The End of History. Now you may thinking what on earth warrants paying $765 for a bottle of beer? Well it'll be the high ABV, the skills needed to brew this beer and the taxidermy skills needed for the bottle. Yes, the taxidermy skills!!! Only 12 bottles have been made (all sold now) and they come with a dead animal wrapped around the bottle, or more precisely the bottle stuffed into the animal. The 12 bottles featured seven dead stoats, four squirrels and one rabbit. 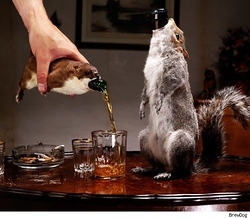 James Watt, one of the two guys behind BrewDog, succinctly put it: "The impact of The End of History is a perfect conceptual marriage between taxidermy, art and craft brewing." Just what we've all been waiting for! Anyone for a furry beer? This is the last insanely high ABV beer these guys will be making and what a bang to go out on. You can read a bit more on the whole idea of the beer and a little video here. For those interested in the beer itself, it's a blond Belgian ale [...] infused with nettles from the Scottish Highlands and Fresh juniper berries. Interesting.